As the Africa Mercy was preparing to sail to Guinea in 2014, a horrific epidemic was declared in West Africa. An Ebola outbreak in the region made it impossible for the Mercy Ship to enter. The ship was diverted to Madagascar for two years. The people of Guinea, Liberia and Sierra Leone particularly were in the hearts and prayers of the Mercy Ships crew and staff around the world during this enforced separation, as many years had been spent serving patients in these nations with both the Anastasis and Africa Mercy. In 21 months the Ebola crisis killed over 2,500 people in Guinea and five times more people across the region than all other known Ebola outbreaks combined. Families were torn apart, schools were closed and the fragile local economies were devastated as life came to a halt in the effort to contain the disease. 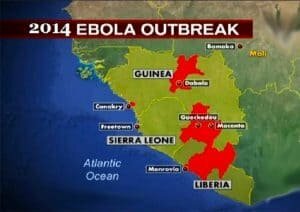 Guinea was declared Ebola-free by the World Health Organisation in December 2015. Now Mercy Ships is finally able to return to Guinea as part of our commitment to sustainable healthcare development in the region. During the Africa Mercy’s 10-month stay in the port of Conakry, Republic of Guinea, Mercy Ships plans to provide 2,000 – 2,500 life-changing surgeries onboard, to treat over 8,000 at a land-based dental clinic as well as providing healthcare training to local healthcare professionals through mentoring and courses.